Buy Rose Bousamra a Coffee. 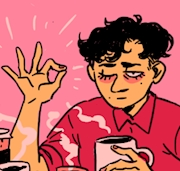 ko-fi.com/rosebousamra - Ko-fi ❤️ Where creators get paid by fans, with a 'Buy Me a Coffee' button. Hi! I'm Rose, I'm just a passionate queer out here on the internet making illustrations and comics. Every little bit of support puts me one step closer to making art my full time job. Thank you so much! Secured Payments. Support goes to Rose Bousamra's account. Upgrade Rose Bousamra to a yearly Gold Membership with a one-time payment.